Stanton® Magnetics, a member of the Stanton Group of companies and an industry leader in the design and manufacture of professional audio products for DJs, will be introducing the Stanton Control System®4DJ (SCS.4DJ) Fully Integrated Digital DJ MixStation at Musikmesse 2011 (Hall 5.1, Stand D98). Immediately upon seeing it in action, it is very apparent something is missing: the laptop! Taking a fresh design approach — the SCS.4DJ was designed with a powerful internal processor that makes fully standalone operation a reality. All users have to do is add their own music and they’ll be ready to go. 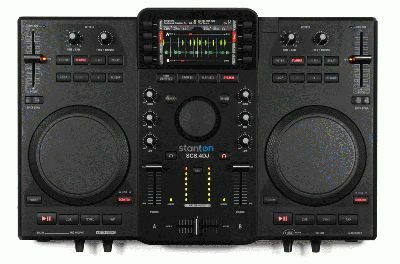 Since all the software for the SCS.4DJ is embedded into the system, no additional communication cables or computers are required. Simply connect a memory device with stored music, analyze the tracks and it is ready to mix. At the push of a button, the SCS.4DJ’s advanced automatic synchronization feature keeps tracks in beat so that you can focus on being more creative with your music. With processing power and transient analysis capabilities rivaling traditional DJ software solutions, this finally means for the first time a fully capable and portable alternative is available. The advanced tempo and beat grid calculation also allows the SCS.4DJ to be placed into “Auto-DJ” mode, where the unit will automatically mix the music in the user’s playlist based on their chosen style of mixing. Users can populate their playlist from their existing digital music libraries. The SCS.4DJ supports WAV, MP3 and AAC files and features four USB ports, two within a hidden compartment large enough for hard drives and media devices. For DJs on the go, SCS.4DJ gives users the durability, portability and flexibility they need to perform night after night, with an intuitive yet simple surface in a rugged chassis. The layout is instantly familiar to the experienced DJ and logical enough for any novice to grasp. It comes equipped with dual high-resolution touch-sensitive weighted platters with cue, scratch and pitch bend control. Visual beatmatching is made easy with the SCS.4DJ’s multicolor 4.3 inch high resolution LCD with dual waveform display. For those looking to MC, while spinning, a microphone input with volume control is located right on the front panel. It outputs to balanced quarter-inch TRS (+4dB), unbalanced RCA (-10dB), quarter-inch stereo headphone, eighth-inch stereo headphone (clone of the quarter inch output) and a USB “B” port for those who would like to use the SCS.4DJ in MIDI controller mode. For those looking to produce their own projects or would like to make their set available to partiers and clubbers, the SCS.4DJ offers recording capability. Press the record button and SCS.4DJ will record a performance to any mass storage device, which can be shared between friends or used to produce a CD for distribution.